This category covers stationery products as well as origami paper, traditional paper, and many more. Bento Erasers - Set of 6pcs Set of 6 erasers which includes 2 bento, 2 cups, 1 nigiri and 1 green tea can.Size: about 2 cm x 6 cm. Eco-friendly, PVC FREENot For Children Under 3 Years. Do not eat. Keep away from children mouths. Japanese Washi Yuzen (chiyogami) paper Sheet size: 97 x 67 cm.Ôgimon prints.Main color: greenUnburned sheet of laid paper.Hand made silkscreened. 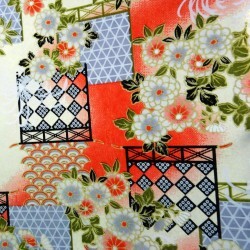 Japanese Washi Yuzen (chiyogami) paper Sheet size: 97 x 67 cm.Kiku (chrysanthemums ) prints.Main color: pinkish redUnburned sheet of laid paper.Hand made silkscreened. Japanese Washi Yuzen (chiyogami) paper Sheet size: 97 x 67 cm.Sakura (cherry blossoms) prints.Main color: blue and green teaUnburned sheet of laid paper.Hand made silkscreened. Japanese Washi Yuzen (chiyogami) paper Sheet size: 97 x 67 cm.Sakura Chô (cherry blossoms and butterflies) prints.Main color: blueUnburned sheet of laid paper.Hand made silkscreened. Japanese Washi Yuzen (chiyogami) paper Sheet size: 97 x 67 cm.Decorated waves prints.Main color: blueUnburned sheet of laid paper.Hand made silkscreened. Japanese Washi Yuzen (chiyogami) paper Sheet size: 97 x 67 cm.Shôchikubai prints.Main color: redUnburned sheet of laid paper.Hand made silkscreened. Japanese Washi Yuzen (chiyogami) paper Sheet size: 97 x 67 cm.Shôchikubai prints.Main color: beige and goldUnburned sheet of laid paper.Hand made silkscreened. Japanese Washi Yuzen (chiyogami) paper Sheet size: 97 x 67 cm.Sakura (cherry blossoms) prints.Main color: blackUnburned sheet of laid paper.Hand made silkscreened. Japanese Washi Yuzen (chiyogami) paper Sheet size: 97 x 67 cm.Sakura (cherry blossoms) prints.Main color: red and raspberryUnburned sheet of laid paper.Hand made silkscreened. Japanese Washi Yuzen (chiyogami) paper Sheet size: 97 x 67 cm.Sakura (cherry blossoms) prints.Main color: dark blueUnburned sheet of laid paper.Hand made silkscreened. 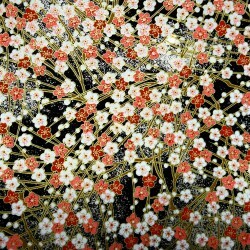 Japanese Washi Yuzen (chiyogami) paper Sheet size: 97 x 67 cm.Shôhakubai (red and white plum blossoms) prints.Main colors: beige, gold and old pinkUnburned sheet of laid paper.Hand made silkscreened. Japanese Washi Yuzen (chiyogami) paper Sheet size: 97 x 67 cm.Sakura (cherry blossoms) prints.Main color: purpleUnburned sheet of laid paper.Hand made silkscreened. Japanese Washi Yuzen (chiyogami) paper Sheet size: 97 x 67 cm.Sakura (cherry blossoms) prints.Main color: parmaUnburned sheet of laid paper.Hand made silkscreened.